Home Eclipse Are you ready for the eclipse? Paper-frame eclipse glasses, including those with whimsical space themes, are the safe and inexpensive way to watch the eclipse without harming your eyes. Eclipse glasses are available from online retailers like Amazon.com and eclipse‑related websites, including, rainbowsymphonystore.com, eclipseglasses.com, www.thousandoaksoptical.com and tse17.com. 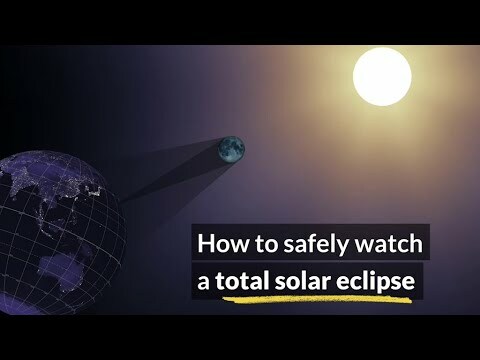 Find eye-safety tips from American Astronomical Society at www.eclipse.aas.org/eye-safety/safe-viewing. You want to see the once-in-lifetime total solar eclipse in August that everyone’s talking about, right? To do it safely, start thinking about eclipse-viewing glasses. On the afternoon of Monday, Aug. 21, South Carolina will experience its first total solar eclipse since 1970. The 70-mile-wide eclipse shadow will begin to cross the state shortly after 1 p.m. Totality—that period when the moon completely blocks all light from the sun and briefly turns daylight to darkness—comes soon after. Only during the few minutes or seconds that totality lasts is it safe to look at the eclipse with the naked eye. Before and after totality—during the partial-eclipse phases—you must protect your eyes. That’s why you need eclipse glasses. While some organizations will be handing out free eclipse glasses to folks who attend eclipse-related events, purchasing your own glasses guarantees you’ll have the proper eye protection to enjoy the show. It won’t break your budget. Paper-framed eclipse glasses are often sold in multipacks and can be as cheap as about 50 cents a pair. Or, you can splurge on plastic frames that run $10 to $20 a pair. For about $2 apiece, you can even buy commemorative eclipse glasses with humorous space cowboy, space alien and astronaut themes. Just be sure the glasses you choose meet the ISO 12312-2 international standard for products made for direct observation of the sun and that the lenses are free of scratches.